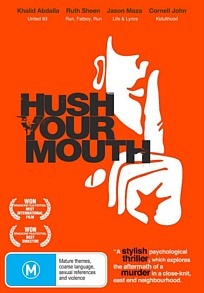 Hush Your Mouth starts off really well, it immediately had me wrapped up in the story but as it went on (and on) my attention started to wane and I lost track of what was happening. The potential is there for this film to be a fantastic, gritty, urban drama but, sadly, it doesn’t deliver on its promise as it lacks structure. There are entire plot lines that seem unnecessary to the overall story. The main character, who is also the narrator, travels off onto tangents and his voice over gives the audience irrelevant information. The 110 minutes that this film goes for felt far longer, a strong sign they should have cut out large portions of the film. While the acting is good in this film, it wasn’t able to maintain my interest and I found myself glazed over and not paying attention, simply watching the images flash past my eyes. The disappointing thing about this is that this film has so much potential. The cinematographer has a clear and distinct style and manages to capture the ugly underworld of London in such a beautiful fashion. In fact most of the individual aspects of the film are done well and in a clever way (except for the moustache on the policeman, which looked ridiculous!) yet they have tried too hard and so the film falls flat. It is trying too hard to be a psychological thriller yet it would have been more suited to a simple urban drama that is at the core of the film. It obviously wasn’t very successful in the UK as it has taken more than 3 years to be released in Australia on a DVD that only has the bare essentials, it doesn’t even have a main menu, simply going straight to the film. The DVD doesn’t have any extras and if the production company aren’t prepared to invest in special features then what does that say about the overall quality of the film? Ultimately this is a disappointing DVD and I can see very few reason to recommend it to anyone aside for those who really love watching long films about the underbelly of London. I somehow doubt that there will be a huge market for this film and I certainly won’t be watching it again any time soon.